Dundee, 14 November, 2014 (Alochonaa): David Cameron punched a podium. Matteo Renzi made threats. Mark Rutte is holding out. And Jean-Claude Juncker has verbally scalded them all. So what’s got the EU so heated up over the past few weeks? 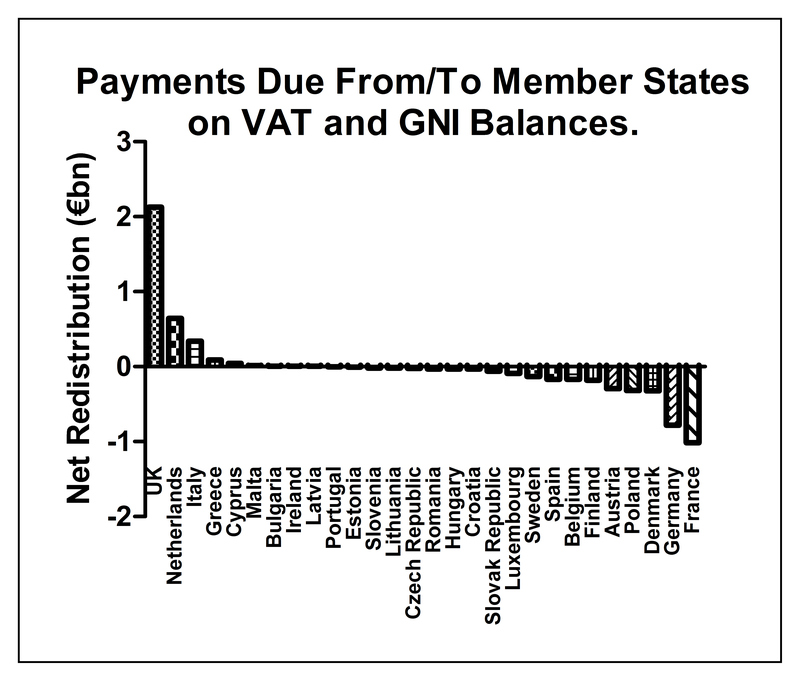 Basically, the EU has recalculated the historic contributions required from member states. The UK, Italy and The Netherlands, among others, have had higher economic outputs between 1995 and 2013 than was previously used to calculate their members’ fees. This, then, is a back payment. To commit the economists cardinal sin (drawing an analogy between micro- and macro-economics); your gas supplier has realised that their meter has been faulty. You haven’t been paying enough, so here’s a red bill. Payment due date: one month. You might recall that recently the UK’s Office for National Statistics (and other countries’ equivalents) recalculated the size of their national income with a slight difference. This time they took into account unreported or under-reported parts of the economy. These include, but are not limited to, research and development, illicit drugs and prostitution. The change in methodology in calculating GDP has been to comply with new EU statistical rules, which came into force September this year. In 2009 alone this added £9.7bn to the UK economic figures, or around 1% GDP. The UK, Netherlands and Italy are the main contributors. France and Germany are the main benefactors. As per the graph above, it can be seen that the UK is the country that is being asked for by far the largest amount, and thus why David Cameron has been the most vocal in objection. This is expected as while facing growing euro-scepticism within his party and certain parts of the UK, the £1.7bn bill is just over 21% of what the UK paid in this year. The bill breaks down over the 18 year period to around £94m, or nearly 1.2%, per year. So David Cameron has refused to pay the full amount in the timescale requested. Matteo Renzi announced that if the EU were to follow through with demands for back payments he would make public the cost of “EU palaces”. Mark Rutte said that he must justify expenditure to his electorate, and that currently he cannot do that. Rutte announced they will not pay until he has seen full and proper calculations, rather than the scant 3 page leaked document which sparked the entire row in the first place. Since the onset of the row, the EU commission has stated that it will allow member states to “defer the required payment over a reasonable period of time”, but that full payment will be required, and still no further details pertaining to the specifics of the calculations. So the stalemate, mudslinging and podium punching continues. Meanwhile the Eurosceptic parties of the UK, Netherlands and Italy (UKIP, The Party for Freedom and The Five Star Movement respectively), with their growing support, are having their agenda spread all over the media. 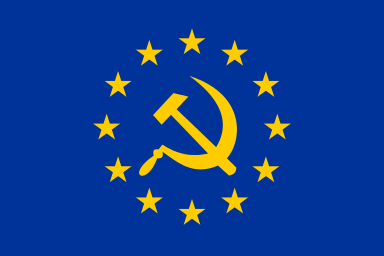 The “EUSSR” flag, used by Eurosceptics to compare the EU to the USSR. The whole exercise will certainly resonate with those who support exit from, or the dismantlement of, the EU, who this year took 25% of total MEP seats at the European elections. Although voter apathy played a big part, the 2014 vote saw Euro-critical parties UKIP (UK), The Front National (France), The Peoples’ Party (Denmark) and SYRIZA (Greece) win, and second places taken by the Five Star Movement (Italy) and Sinn Féin (Ireland). So, what to make of the whole situation? It’s this writer’s opinion that no matter what the reasons for changing the methods used for calculating member states’ future contributions, backdating to 1995 will have one main effect; fanning the flames of Euroscepticism. For the EU commission to have done this is an extraordinary example of bureaucratic self-harm. * Chris is Alochonaa’s Science and EU Affairs Editor.